April 24, 2014 By This post may contain affiliate links. Break open one of these colorful Sombrero Piñata Cookies to reveal the surprise inside! These festive candy filled treats will be perfect for Cinco de Mayo or a Mexican Fiesta. I absolutely love making piñata style cookies with candy inside. Over the years I’ve made candy filled Baseball Cap Pinata Cookies, as well as, basketballs, ladies hats, apples, witches, black cats, black cats, graduation caps, ears of corn, and more. Check out all my candy filled piñata style cookie tutorials. It is so much fun sharing these cookies with friends and family or serving them at parties. When people bite into them or crack them open and find candy inside they are always so delighted. They also are always so impressed with the 3 dimensional aspect of the cookie design. Last spring, we traveled with our exchange student to Mexico and enjoyed a traditional fiesta. Everyone was given brightly colored sombreros to wear during the party, but only a handful of fun loving party goers actually wore them. They were the same people up on their feet dancing to the mariachi music. At one point in the night, all the kids were invited to try their hand at cracking open a giant pinata. When it finally broke open, candy flew everywhere, and the kids dove to the ground to grab it. A few years ago I was asked to create sombrero cookies for Tablespoon.com and I thought it would be really fun to make them pinata cookies, filled with tiny little candies. And, you don’t even need a big stick to get to the hidden treats. Just break open a cookie and the candy will spill out. I made my original Sombrero Piñata Cookies using a cookie mix and they were so popular that I wanted to make a video tutorial and decided to recreate them using my favorite cut-out cookie recipe. You can see from the pictures above that the cookies are decorated slightly different. 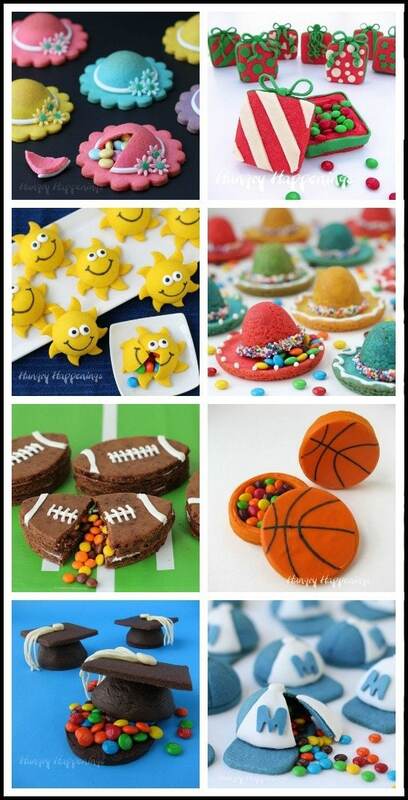 You can get creative and decorate your sombrero cookies how you like using frosting or candy melts and sprinkles. These cookies do take a bit of time to make but really are not that challenging to make if you have the right tools. You will need whoopie pie pans to bake the hat brims. You could use a round cookie cutter, but I like using the whoopie pie pan because the cookies bake with a slight curve at the edge, giving them a more realistic shape. To make the domed hat crowns you’ll need to use Wilton Silicone Brownie Pops Molds. They have the perfect shape to create the egg shaped hat crowns. You will par bake the cookies then use the handle of a wooden spoon or utensil to reform the well in the cookies as they will have puffed a bit during baking. Then you’ll pop the cookies back in the oven and bake them a little longer. Another tool that I used is a SqueezeIt mold painter which is essentially a small squeeze bottle that has a coupler and small round pastry tip attached. I love using them because I feel like I have more control than when I use a pastry bag. Just note that you have to reheat the bottle of Candy Melts and clean out the tip using a toothpick often. So, if you prefer, you can simply use a disposable pastry bag or even a zip top bag. The recipe below will make a total of 32 sombrero cookies (8 of each of the 4 colors). You can bake the cookies in batches using 1 whoopie pie pan and one brownie pops mold, but I suggest investing in at least two of the brownie pops molds. It will save you a lot of time. You can find the supplies needed to make these Sombrero Cookies Filled with Candy from Amazon (commission earned for affiliate sales). After your round cookies come out of the oven you can use a pie stamper or the back of a glass to press down on the cookie to really give the edge the curved look. Once baked, run a thin plastic spatula around the edge of the cookies and they will pop right out. You won’t completely fill the brownie pops pan with dough so the baked cookie might have a bumpy top edge which means the cookie might not side flat. Use a small knife or microplane grater to smooth the edge if needed. Color your cookies using any food colors that you like. You can even leave the dough plain and make the cookies look more like traditional straw sombreros then use colored candy melts to decorate the cookies. I used M&M Minis to fill my cookies but any small candies will work. 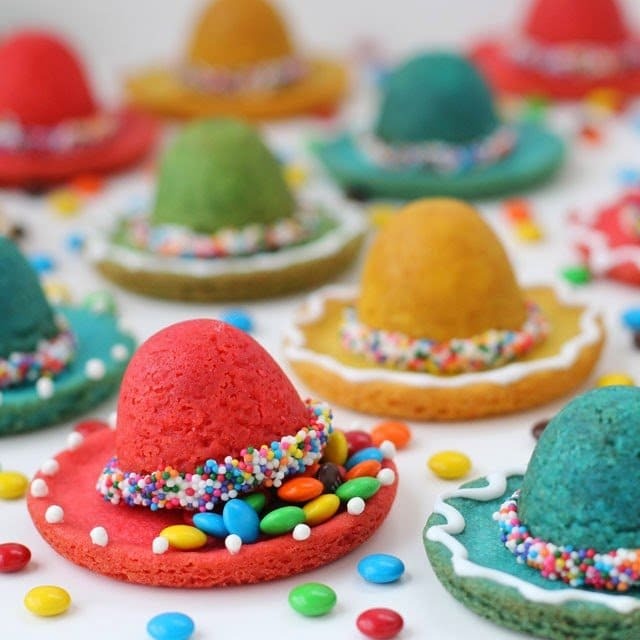 Brightly colored 3 dimensional cookies shaped like sombreros are festively decorated and filled with candies. Mix the flour, salt, and baking powder together in a bowl. Stir in vanilla bean paste, and almond extract then mix in the eggs. Add the dry ingredients and stir just until blended. Divide the dough into 4 equal parts (about 1 cup of dough per color). Scoop out tablespoon size spoonfuls of dough and press into a whoopie pie pan creating a total of 8 of each color. Bake for 10-12 minutes until the edges of the cookies turn light brown. 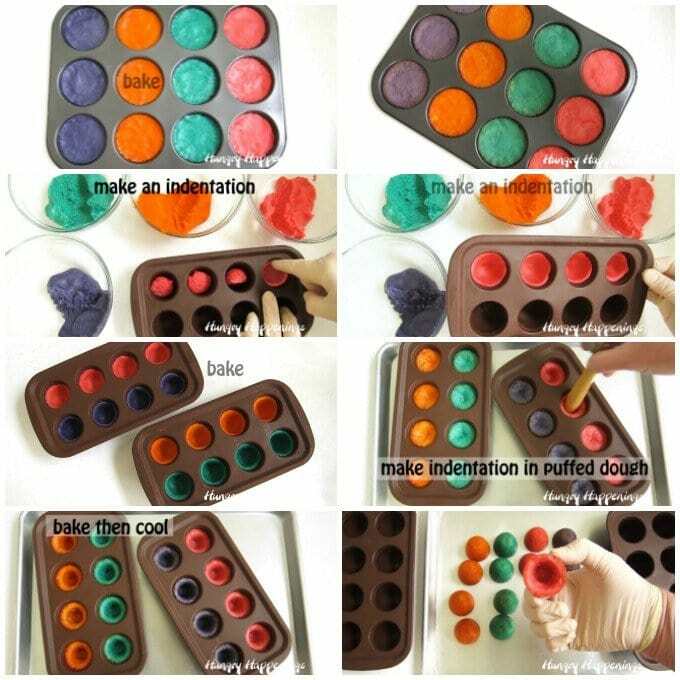 Scoop out tablespoons size spoonfuls of dough and press into individual cavities in brownie pop silicone molds, making 8 hat crowns of each color. Use your finger to create a well in the center of each dough ball. Press the dough up the sides of the mold, up to the fill line, about 1/4 inch from the top of the mold. Freeze molds for 15 minutes. Remove from oven and use the handle of a wooden spoon to reshape the well in the cookies. Return to the oven for 6-8 minutes until cookies are baked through. Reshape the well in each cookie if needed. Allow to cool completely, then remove from mold. Pour melted white Candy Melts into a squeeze bottle or disposable pastry bag. Turn a hat crown upside down and fill it with M&M Minis. Pipe a line of white Candy Melts around the rim of the hat crown cookie. Immediately turn one of the round cookies upside down and center it over the hat crown. Press the two cookies together then carefully, holding the top of the hat crown and the bottom of the round cookies, flip the whole thing over. Set it on your work surface and pipe a line of white Candy Melts around the base of the hat crown. Pipe decorations on the hat brim. Set aside to allow the candy to dry. Party it up this Cinco de Mayo and check out some of these other recipes that are perfect for celebrating. 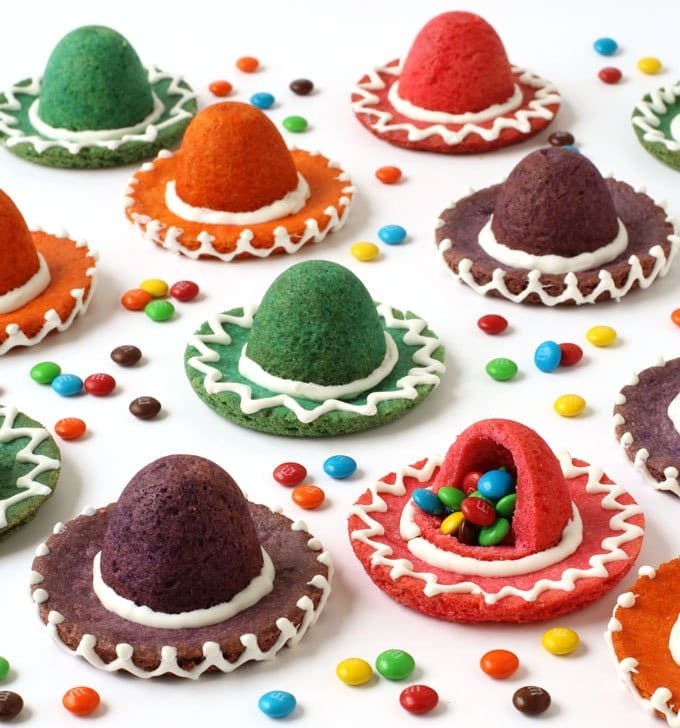 To see the step-by-step tutorial to make these Sombrero Pinata Cookies using a cookie mix head on over to Tablespoon.com. These are adorable! Love all the bright colors! Thanks, Elizabeth. I was happy to be able to get such vibrant colors in the cookie dough. These are genius, Beth, and so cute and colorful! I love them! once again – completely ridiculously creative and adorable. you are enormously talented! Thanks, Carla, that is so nice of you to say. Thanks, Karen. We had such a great time in Mexico and I wish I were there with our exchange student right now:) We had some pretty amazing experiences there, like swimming with sea turtles and riding bikes through the ruins. It was really a wonderful trip and it did inspire us to host a Mexican themed Halloween party this past year. I hope to go back some day. These are adorable! They look time consuming, but worth it. I'm glad I found your post through the Strut Your Stuff link party. Thanks, Anne, I'm so happy that you stopped by tonight to check them out. 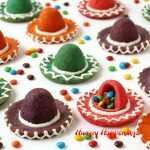 Thanks so much for linking up these cute sombrero pinata cookies on our Strut Your Stuff Saturday Link party. These are perfect for our party! I can't believe I'm still not getting your posts and I'm happy I searched you out and saw these adorable piñata cookies – they're great! I'm glad you stopped by to see what I've been up to! I love how colorful these are! Great idea for Cinco de Mayo! I love all of your "pinata-style" hidden surprise cookies!! These are adorable and such a creative idea! Pinned and excited to give them a try! 17 ounces of flour on top of 4 cups? Couldn’t you just include the total amount of flour in cups-not ounces. Is this correct? 17 ounces is 4 cups of flour. You can measure it either way but it’s always more accurate to weigh flour.